Conestoga Builders, Inc.offers several choices in two-story and single story buildings, with appropriate modifications, suitable as accessory living quarters. The garage doors can be eliminated or substituted with an entrance door. These unfinished models can be custom-built to your specifications. 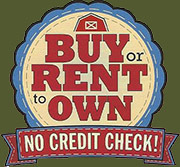 These are not Rent-to-Own models. Upscale two-story custom-built home quality guest house, studio apartment above garage, work studio, home office, workshop or storage building. Offers great looks and versatility! Economical two-story guest house, home office, cabin, workshop, garage, storage building, barn. Home quality construction also makes this a great potential one-story guest house, work studio, workshop, home office, cabin.